What do you buy at Trader Joes? Funny huh? Since moving to California we have been more conscience of what we are putting in and on our bodies. The town we lived in in North Carolina was a small military town that catered to young single marines (ie: strip clubs and Hooters) so we had the regular chain places to eat and shop. Boring! After being there for 4 years I was ready to leave. Now I know that Trader Joes is a chain store, but you can find some really good and natural foods and products there. We are loving that we have “choices” here and that Walmart is not our only place to shop (and I’m not that crazy about walmart either). So usually on our list of things to get is cheese, nuts, fruits and veggies, the occasional beer when hubby is feeling for something different, breads, some meats (their turkey sausage is really yummy), chocolate ( I L-O-V-E the tahitian vanilla caramel) and now my all time (and hubby too) shaving cream. 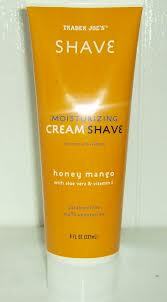 It smells yummy, a little goes a long way, it makes your legs (and face) soft and so easy to shave with. Hubby raves about this stuff and normally he is an Edge gel kinda guy. Posted in Green and tagged trader joes. Bookmark the permalink. Which by the way is my favorite color, but I’m sure you know that like a lot of people I am now one that is trying to go greener with our life. I have started looking at our body products that we use on a daily basis and with some research and you tube videos there is a LOT of items that I use that contain parabens in them (and other ingredients that I will talk about later). WOW!! I was totally shocked. 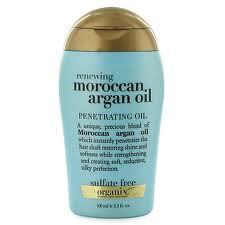 So the first product I am going to boast about is Organix Argan Oil. I used just a tiny drop this morning (now granted I have short hair, so if you have long hair you may need more) and ran it through my damp hair and I already noticed a difference in how my hair was acting. After blow drying it is soft, non-greasy, and shiny. I know I am going to be using it everyday as a daily staple. As far as all the other products, well I am still getting my money out of those and once I run out I will be replacing it with something that is better for our skin. As much as I would love to throw it all out, that is just a lot of dollar bills that I will see in the trash and can’t bring myself to do it. If you know of other great green products that I need to try, please leave them in the comments. I would love to hear what works great for you. Posted in Green and tagged healthy, organic, paraben free. Bookmark the permalink.